It’s here! 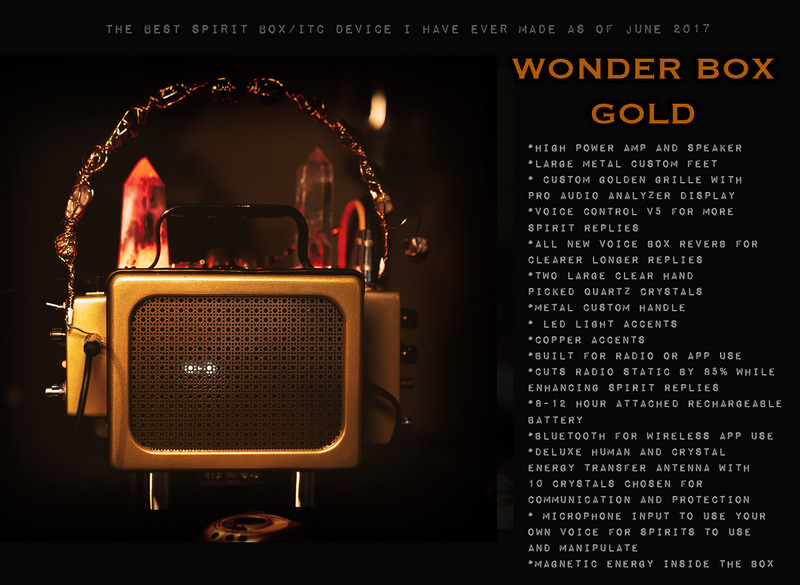 My newest Wonder Box and it is the best box I have ever made for clarity, response and what it can do for a hack spirit radio. A video will be up soon of me using this box in a session but I wanted to share a little bit about it. For now, it is not for sale but for me to use and test over the next couple of weeks. If this box does what I think it will for improving the already great communication then I will think of offering 2 or 3 for sale to experienced researchers or teams. This Wonder Box Gold has everything, and I mean EVERYTHING that has worked for my communication up until now, and then some. It was built by me AND the spirits as over the years they have helped me to create the SCD-1, the portal and now THIS. The Gold features and all new Human Energy antenna with 10 crystals and one “connection” crystal to touch during communication. The antenna alone cost over $90 to make and 5 hours to assemble. The Wonder Box itself has everything custom from the large metal feet to the custom made grille with gold metallic protection cover to the custom gold and bronze two tone paint and clear coat finish. Im using the latest voice control feature for more replies and the latest and newest “voice box” reverb that has two settings built in for ITC. One is more effective but harder to make out and one is clearer but less replies. Can now choose by the press of a button which one you want. Also this can now cut radio static down by 85% while making spirit replies longer from hack radios. Direct Line Reverse mode is still here for those times when you want to show a mode that is UN DEBUNKABLE. Two large clear quartz crystals that cost me $100 for the pair (hand picked by me from a local source) are implanted here as well. Copper accents, mic input mode for using our own voice for spirit to manipulate, 8-12 hour embedded rechargeable battery, LED light accents to light up the crystals and even bluetooth for running apps wirelessly. 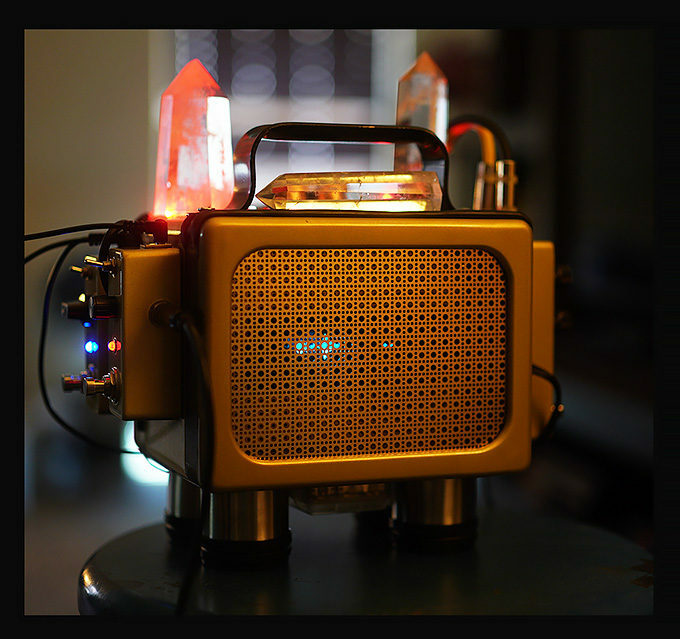 Before the finishing touches were added (antenna, etc) – ALL Gold. Magnetic energy is inside the box for the GOLD as I feel it can help with spirit communication. Still uses a high power amp and large speaker for full, rich loud volume and clarity. No tinny or muffled sound here. Stay tuned for a video of me using this new box. The last few videos have shown me testing different things on different boxes, and now they have been implemented here, on this one “Statement Piece” by me. The best box I know how to make as of June 2017 and there is NOTHING like it in the world today for what it can do, how it does it and what it sounds like. 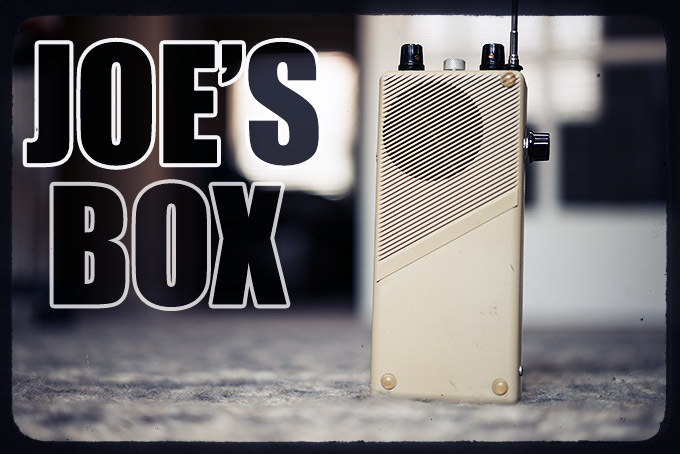 This is a “Hand’s On” type of box that one can tune in to his or her liking as well. Very easily. This one has had all of my passion, energy and love go into it and I can not wait to use it. It’s also the most expensive box I have ever built with parts costs being higher than any box I have ever made. For me, it is well worth it to keep pushing on with this research and keep improving our connection with the other side. I CONNECT with the dead using ONLY this APP. 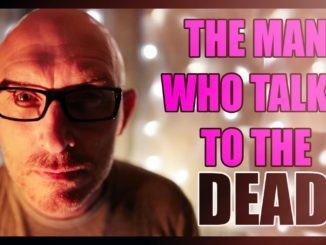 August 21, 2018 E.V.P., INCREDIBLE, SCD-2, Spirit Box, Spirit Communication Comments Off on I CONNECT with the dead using ONLY this APP.